Blurb Description: When blacksmith apprentice Fletcher discovers that he has the ability to summon demons from another world, he travels to Adept Military Academy. There the gifted are trained in the art of summoning. Fletcher is put through grueling training as a battlemage to fight in the Hominum Empire’s war against orcs. He must tread carefully while training alongside children of powerful nobles. The power hungry, those seeking alliances, and the fear of betrayal surround him. Fletcher finds himself caught in the middle of powerful forces, with only his demon Ignatius for help. THIS BOOK BLEW MY MIND, OKAY? It sucked me in, with its complex simplicity and wonderful characters and perfectly paced writing and I’m so itching to jump into book two, but I’m stopping myself so that I can blurt out this (very fangirl-y) review. I’d had my eye on The Summoner Series for a while now when the lovely people over at Hachette India decided it would be a good idea to feed this ravenous book dragon. Which I should REALLY thank them for, because HELLO, NEW FAVOURITE SERIES. 1. The Pacing: There was never ONCE in this three hundred and ninety page masterpiece of awesomeness that I felt like I, the reader was being rushed, or that I was getting pushed towards that inevitable ending, or ANYTHING. Taran Matharu gave this undeniable importance to each and every scene, and not just the ending, and I LOVED IT. 2. The Detail in Summoning and The Classes: Another thing that was SO BEAUTIFULY DONE was the detail involved in Summoning demons – both simple enough to understand and complex enough to keep you wanting to learn more. I LOVED the different classes in the Vocans Academy (where Summoners are trained) and how each teacher had a different personality and that the classes themselves weren’t just written over! AMAZING! 3. Fletcher (The Chosen/ Not Chosen One): You know how Harry Potter is The Chosen One? Well’ if you’re an experienced Fantasy reader, or just a reader in general, you’ll know that there is ONLY ALWAYS one main character. The Novice, however, WAS ALL ABOUT TEAMWORK! Even at the final fight, or at the testing of how strong a Summoner was, Fletcher was not portrayed as some God, or an ultra-powerful creature, but rather as a boy in training to get better, and it was AWESOME! 4. The Aristocracy, The Elves, The Dwarves and Unfairness: I ADORED HOW THIS WAS DONE. I adored how they showed that there would always be a divide between the commoners and the nobles and the elves and the dwarves, and that there were even biased teachers that would only support the nobles. Don’t get me wrong, their one sided thoughts made my blood boil, but it was such a good story arc, I fell in love with it too. 5. The Demons: ACK! There were ALL SO AWESOME! I loved the creativity in each demon, and the powers and the levels and the loyalty and the friendship between demon and human. PERFECT! All in all, as I said before, The Novice COMPLETELY blew my mind, and now kindly excuse me as I slink off to read The Inquisition! What was the last fantasy book you read and fell in love with? 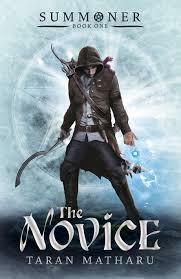 Have you read The Novice? What did you think of it? Do you love teamwork books, or do you prefer just one hero/ heroine? Which are the COOLEST demons you've heard about? I can't wait to hear from y'all!